Apple concentrate consists of polyphenols, which helps in protecting the bones during menopause, offers relief from respiratory disorders like asthma and others, helps in preventing Alzheimer's disease, keeps cholesterol levels under control, reduces the risk of various cancers, keep diabetes under control, and helps in weight loss. Apple concentrate can be related to the cognitive decline of normal aging, pulmonary function, bone health, and gastrointestinal protection. Some of the polyphenols available in apples that help in fighting diseases are hydroxycinnamic acids, dihydrochalcones, flavan-3-ols, flavonols, and procyanidin B2. The apple juice market will continue to witness sales due to the aforementioned health benefits, over the next eight years. 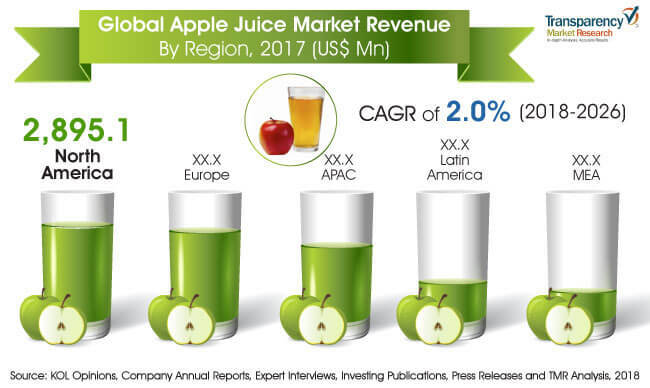 However, during 2018-2026, the overall growth of the global apple juice market is estimated to be sluggish at a CAGR of 2%. By 2018 end, the revenue generated from apple juice sales worldwide, will possibly reach around US$ 7,163.8 Mn, which is further expected to cross a value of US$ 8,300 Mn by the end of 2026. Apple is one of the most widely cultivated tree fruits, and the third-most internationally traded fruit, following banana and grapes. Apples are commonly consumed not only because of their flavor but also because of the important nutrients that they contain, including high levels of antioxidants, vitamins, and dietary fiber. There has been significant growth in the consumption rate of apple flavored juices, sauces, as well as apple juice. The confluence of consumer perception for apple flavored product consumption helps to drive the demand for the product in the global market. The shelf life of apple juice concentrate ranges from 1-3 years, and depends on the type of concentrate. Also, finished products made from concentrates will have their own shelf life - six months to years, and this depends on the conditions in which the finished products are stored. Long shelf life not only helps in storing concentrates for longer periods but also eases transportation and use at a later stage. Apart from regular products made from apple concentrate, specialized products are also made for the military and astronauts. Juices made for the military generally have a shelf life of 4-8 years, which is three times the shelf life of juices available for civilians, which is further driving the market growth during the forecast period. However, the availability of apple is the biggest challenge these days. Farmers are facing challenges in apple production because of changing climate and natural disasters. The production of apple depends on water availability, climatic conditions, and other factors. Limited availability of apples is creating hurdles in the expansion of business, although the demand for processed apple products is increasing day by day. Apple is consumed in both, the raw and processed form. Till date, people prefer to consume apples in the raw form, which limits the supply of apples for the processing industries. According to USDA, the production of apples decreased globally by 2.6 million tons over the 2017/2018 season. The global production for the season was around 76 million tons. This loss was attributed to the bad harvest of apples in Europe owing to an early start to blooming in May, frost in April, and heat in July, which put pressure on the volumes and quality. On the basis of region, the market in North America and Europe is expected to dominate over the forecast period followed by Asia Pacific. Asia Pacific is expected to become a prominent market by the end of the forecast period with a significant CAGR attributed to increase in product penetration and rising awareness through various promotional activities. Some of the major companies operating in the global apple juice market are Del Monte Food, Inc., The Coca- Cola Company, Tree Top Inc., Parle Agro Pvt Ltd, Britvic Plc, PepsiCo. Inc., The Kraft Heinz Company, Manzana Products Co., Solana Gold Organics, Eden Foods Inc., White House Company and others.